We Filipinos spend enormous time and energy talking about politics, i.e. political criticism. At best and rarely on matters/issues of political independence. At worst, oftentimes and predominantly, on personalities of our politicians at the national or local level). We do not seem to appreciate the fact that economics: national economic development aka political economy is also vastly important and at this point in our history, requires equal, if not more, attention from the native citizenry. For without economic independence, political independence becomes ineffective and meaningless. Just like an individual with nothing except debt who therefore effectively becomes a person with no voice and is ignored. So we as a people, in our homeland and the world, are not in the radar of our native rulers and of many nations/peoples of the world. Below piece came from a recent book written by former Economic Hit Men (EHM) individuals who worked for years representing the largest American banks as loan officers to Third World countries like our homeland. These few individuals later realized that they were tools of their financial institutions (multinational banks) by their work in arranging foreign loans to poor countries, including our homeland; giving loans that made them poorer. Their consciences made them tell us the tricks of their trade. With our homeland as a primary example and as poster boy for the Third World, these EHMs provide us insight on who they were, their background, how they did their transactions, whom they dealt with, the milieu they had, etc. Their works can only be summed up as the modus operandi of creditors (multinational banks) and debtors (our homeland represented by our native technocrats and ruling regime) and how all of their business led only to our continuing, decades-old and present national predicaments; characterized by deepening and expanding mass poverty, with all its adverse socioeconomic and political consequences. By making the country such as our homeland as the only debtor (rather than lending directly the private businesses who needed capital), the creditor banks via the IMF and WB tandem were able/can enforce payments, dictate to our homeland all changes they wanted in our government policies which greatly profit them; and conversely led to our national detriment. In the long run, as we now see or not still see, changes that negatively and gravely impact our domestic institutions: education, national economy and patrimony, native entrepreneurs, national sovereignty, etc. and further facilitated the penetration in our society by economic and cultural globalization --even before the term globalization aka neoliberalism became common currency. All these lead to our national perdition. The early 1970s. The Vietnam War is in the headlines daily. Mass demonstrations are rocking the world. Policymakers think in terms of the domino effect in the bitter struggle between communism and capitalism. In the Philippines, strongman Ferdinand Marcos holds power, but there's a growing insurgency in the countryside. In the eyes of the United States and the World Bank (WB), Marcos is the only thing standing between one more country falling to the Reds in the Cold War. Direct aid is one way to keep him in power. The other and more potent means: World Bank loans, with their oversight and conditionalities. With an American always the president of the World Bank, the United States got what it wanted --with disastrous results for the Philippines. 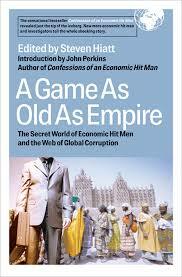 But this time, thanks to whistle-blowers inside the World Bank, we can get an insider's view of how the development game is played and why the results are usually far from the official rhetoric. The US-Philippines relationship goes back a long way, though few remember the Spanish-American War from History 101. The US "purchased" the Philippines after defeating Spain in 1898. The Philippines had been under Spanish control for over 300 years, and Filipinos did not welcome another master. In fact, a provisional government led by Emilio Aguinaldo had been set to take power after assisting the US-forces. Instead, the Filipinos were swept aside and a bloody insurrection ensued, which was finally defeated after several years and the loss of at least 250,000 Filipino lives. The U.S. established a typical colonial relationship, with the Philippines exporting agricultural commodities such as sugar and importing American manufactured goods. In 1946, the U.S. granted independence --keeping 20 military bases, including Clark Field and Subic Bay. During its rule, the U.S. allied itself with the country's wealthy land-owning elite, which maintained political power after independence. Coming from this strata, Ferdinand Marcos assumed the presidency in the 1960s. In a particularly corrupt and violent election, he secured a second term in 1969, in the process using up the government's foreign exchange reserves. Without reserves, the country was unable to cover a huge trade deficit and pay interest on mounting external debt. Marcos turned for help to the World Bank. One of its conditions for assistance was a 60% devaluation of the peso. In the 1970s, currency devaluation was the standard Bank prescription for Third World countries and needing loans. In theory, this would bring the trade account into balance by increasing foreign exchange earnings from cheaper Philippine goods while decreasing outward cash flow for now more expensive imports. In fact, devaluation brought disaster to businesses and workers alike. Scores of Filipino entrepreneurs were thrown into bankruptcy when suddenly confronted with more expensive imported components for their products. (1) The wages of urban workers dropped as much as 50%. The collision of the World Bank's macroeconomic policy and real people's lives was bloody and left a multitude of casualties. Currency devaluation is part of the broader policy of liberalization --sometimes called neoliberalism --which is both the standard precursor to structural adjustment loans and a continuing part of the structural adjustment package. liberalization is at the core of World Bank trade policies, for the Philippines as well as most other developing countries. Liberalization can be a very confusing word. In common usage, liberal means "progressive, imbued with compassion for the less fortunate, and a willingness to put government resources into redressing past harms and creating social and economic equality." The problem with the World Bank/International Monetary Fund model is that no country using it has ever developed successfully. "We violated all the laws we impose on countries today. We depended on protective tariffs into the early 20th century. We also violated all the intellectual property rights we now hold sacred. The U.S, chemical industry got started during WW1, when we stole the German patents. In the 19th century, U.S. publishers were notorious for republishing works of foreign authors without permission or royalties. Orthodox economics insists on letting the market work and subjecting domestic producers to foreign competition. but this is also the ideology of the strong. You want to prescribe free competition and liberalization when you're the big guy on the hill, because no one can compete with you. So on the way up, everybody's a protectionist. but once you get to the top, you're a free trader. "Export-oriented development is still the absolute centerpiece of orthodox development theory. Countries like the Philippines have dire domestic needs that should take precedence over export-oriented development. here's just no way that they can meet the needs of their population under this model. It's economically unwise, but it's also a crime against humanity to put exports ahead of the needs of a very hungry and hungry, ill-educated population. "What you would ideally want --and what is not happening-- is for the multinationals to do some degree of skills and technology transfer, such as using Philippine engineers instead of importing their own engineers from home. They would start training the workers to do more and more skilled work rather than just routine assembly tasks. They would develop suppliers locally; components would be made where they're assembled. That's the way a country could use foreign investment as a real development strategy. This would also provide hard currency to service the loans --since World Bank loans can not be paid back in a country's own currency . Local governments can't get much in the way of tax revenue out of these multinationals because they're getting tax holidays and paying very low wages. That's why, despite opening up to foreign investment and doing everything they're supposed to, so few countries succeed in this game. It's pretty much stacked against them. Clearly, the Philippines is not one of the winners. A country that has been using an inflation based taxation system undermines the entire basis for societal development. It destroys the entire basis for the labor value creation process. Money after all is the alien abstract of labor. Hence only a few retain the wealth and continuously invest their wealth only in the land to hedge against the debasement of currency. * "Lenin is said to have declared that the best way to destroy the capitalist system was to debauch the currency. By a continuing process of inflation, governments can confiscate, secretly and unobserved, an important part of the wealth of their citizens. By this method they not only confiscate, but they confiscate arbitrarily; and, while the process impoverishes many, it actually enriches some. The sight of this arbitrary rearrangement of riches strikes not only at security, but at confidence in the equity of the existing distribution of wealth. Those to whom the system brings windfalls, beyond their deserts and even beyond their expectations or desires, become 'profiteers,' who are the object of the hatred of the bourgeoisie, whom the inflationism has impoverished, not less than of the proletariat." " As the inflation proceeds and the real value of the currency fluctuates wildly from month to month, all permanent relations between debtors and creditors, which form the ultimate foundation of capitalism, become so utterly disordered as to be almost meaningless; and the process of wealth-getting degenerates into a gamble and a lottery." I found this particular e-mail transmittal so important to be disseminated to as many potential readers in cyberspace. Thus, while sending a reply to you, I decided to send a copy to several e-groups whose fora remain worthwhile to use for presentation of ideas for consideration of the more politicized denizens in cyberspace. We do not seem to appreciate the fact that economics: national economic development (political economy) is also extremely important and at this point in our history, requires equal, if not more, attention from the native citizenry. For without economic independence, political independence becomes ineffective and meaningless. I have to express my strong disagreement with the basic premise built in these two (2) statements. By this time, politics and economics are intricately not just inter-related but inter-dependent variables for humankind's development. Available documentation, including those referred to in your e-mail, confirm that the political dimension has greater weight as a direct determinant of the potential policies that will be adopted by both global and localized organizations/governments/countries. The IMF and WB entities are the concrete manifestations of how the political dimension determines the direction of economic policies. In short, whoever has control over the IMF and WB basically determines the economic parameters that will have to be faced by governments/countries, directly in connection with negotiations for loan availment. The other side of the coin involves the political leadership of the borrowing countries. There is a great volume of research done by the Freedom From Debt Coalition on this. The bottom-line is that theoretically, if only the political leaders of borrowing countries truly represent the welfare and benefits for the majority of the citizenry, the IMF and WB funds can be negotiated with reasonable terms and conditions for specific programs and projects for economic development of countries like the Philippines. It should really be a no-brainer about the IMF and WB as creditors, attempting to swing loan contracts that will tie down borrowing countries to remain as borrowers. Creditors always want debtors, plain and simple. It is incumbent upon the representatives of borrowing countries to secure the best terms and conditions for specific loan contracts with the IMF and WB. From where I am looking, the burden is not on the creditors like the IMF and WB. The burden is on the side of the debtors. And the real issue lies in the political dimension of the borrowing countries/governments. I think and believe that Karl Marx was one of the greatest thinkers of all time, and as a social critic, one with deep insight, originality and humanity (on human alienation). In your comments re Lenin, I say that I also find Lenin's writing in his "Imperialism - the Highest Stage of Capitalism" as almost, if not entirely, pre-scient now that multinationals (largest banks/financial institutions)have heavily influenced if not controlled the governments of the rich countries (and of course as a consequence of the poor countries like our homeland). It can be said that is the logic of capitalism - growth, i.e endless growth in capital formation for those who have the latter. It may be the case that their [Marx & Lenin] solutions then and now are not feasible in the long run, as we have witnessed. But their identification/analysis of acute problems in capitalist societies are oftentimes accurate. Thank you for forwarding the post and feedback. I understand your differing opinion. As they say it taskes two to tango. We know regarding the dealings with the primarily American-controlled IMF/WB (now via WTO) that our rulers --since the Marcos Dictatorship-- simply agree and obey the conditionalities to preserve the status quo. And let us always remember that even decades before our homeland fell into the debt trap, our rulers since American colinialism through our so-called independence (political, not economic since we never attained the latter) consistently followed America like a dogface; whoever has the gold, usually makes the rules; though one can break or not follow if brave enough, wealways follow (our rulers were not brave enough). You highlight political leadership is the cause. As I alluded and as you may know, our rulers are not nationalistic as they see only their self-interests, not the "common interest or common good" of the native majority. There are many reasons. Among which we note that the history of our [Filipino] politics --is essentially a history of a feudal/traditional society, of landed aristocracy with its ignorant and impoverished tenants (virtual slaves) dealing in sugar, rice, coconut, and a few more commodities; of treachery, of arrogance towards the poor, of pursuit for political power thus reinforcing their economic power (joined now with the nouveau riche by those with mostly ill-gotten wealth who reached political power --via merit and/or celebrity status-- and used to obtain economic power); etc. We as ordinary citizens watch this vicious circle for generations. To the so-called educated in the know we deserve it since we allow it to happen, because we Filipinos deep down have only our selfish selves. We are class- conscious, look out only for ourselves, relatives and friends at best. The rest, to hell with them. We look at our corrupt politicians, we complain or maybe not, because we wish to be with them, to have the same opportunity. We claim to be Christians but we practice "split-level Christianity," from petty to grand scale in our now culture of corruption. Maybe our grandparents/parents, etc fed us from stolen stuff, saw that they steal, gain hidden wealth in cahoots with the ruling elite, etc. And maybe our Catholic schooling on social teachings was not taught or was absorbed only skin-deep, never integrated/internalized within ourselves, and our rulers --supposed to be role models -- are surely bad role models. As to the ordinary Juan de Cruz or Pepe & Pilar, let us not put blame on them, the impoverished and ignorant native majority. If we sincerely know and appreciate their state of living, or more aptly state of existence, then we would understand why they sell their votes, why they commit petty crimes, etc. We the educated ones, who can spend time in the internet, should attend to inform them (not just our clique of so-called educated selves and of mutual admiration --- of what we know, of what really happens, then maybe we can help make changes in the leadership, a nationalist leadership). Hopefully, as in the 60s such a mass education will produce leadership to our nationalist liking. The nationalist struggle will produce them. We do not need knights in shining armor. We will not have one. Else God would have made angels, instead of men, to run the country. 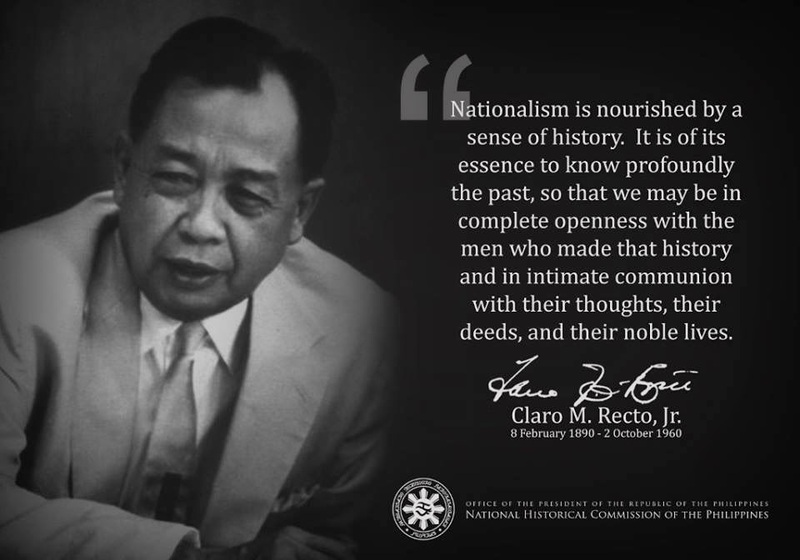 Without recognizing and fighting for Filipino nationalism, as sine qua non, we will not think, we will not act to have fundamental/radical changes in economics and politics; With strong nationalism, it will not be easy, but very difficult and probably bloody and deadly. See what happened to Mossadegh, Trujillo, Allende, Bishop Romero, etc. to name a few. If we are united by nationalism, then the resultant/chosen leadership will be nationalistic and brave. When people and leaders are in the same nationalist wavelength, then we have a good chance of having changes in our homeland/society; and/or dealings with foreigners/foreign entities for directed for the betterment of the native citizenry. Hopefully with the new president the Philippine economy will improve. Other blogs have published confidence on the new Aquino administration.